Summary for the Busy Executive: Classic. Once again, thank ArkivMusic for rescuing a treasure. I bought the LP version twice, since I had worn the grooves of my first disc to glass. The CD, part of the "Julian Bream Edition," features two of the finest performers of their time in one superb work after another. I loved Julian Bream beyond all other guitarists and lutenists. I even heard him several times in concert. He had more colors at his command than his contemporaries, a mind that comprehended musical architecture and that could convey it to the listener, and superb taste. He commissioned major works from major composers, mostly British ones, even those who didn't play the guitar (almost every single one of them), and gave them a chart and a pep talk. Composers often gave him their best. Peter Pears, of course, is linked indissolubly with Benjamin Britten, who took him on as both lover and muse. Britten's concentration on the tenor voice is due mainly to Pears. He premiered such works as Peter Grimes, Albert Herring, the Serenade, Nocturne, the Michelangelo Sonnets, the War Requiem, Billy Budd, Gloriana, and on and on. Pears had an unusual voice, somewhat reedy, which may take some getting used to. His weak point as a singer was his diction. His mouth sometimes seemed full of hot mush. Offsetting all this, however, was a tremendous musical and poetic intelligence and an ability to communicate to a listener. He was one of the best Schubert singers I've ever heard. If you come across his Schöne Müllerin or Winterreise, snap 'em up. How well do the composers here use the guitar? Britten had an extraordinary sense of an instrument's capability. His guitar music, even the accompaniments, are simultaneously virtuosic and idiomatic. Walton also writes for a virtuoso, but with slightly less ease. Mátyás Seiber's are idiomatic and appropriately folk-like, rather than virtuosic, while Peter Racine Fricker's "O mistress mine" artfully works from a Hindemith base. Britten links both Bream and Pears. Bream originally performed as an onstage musician for the premiere of Britten's Gloriana. He also arranged Britten's "Courtly Dances" for small ensemble and lobbied Britten for new music. Songs from the Chinese and the folksong arrangements are some of the results. Songs from the Chinese sets Arthur Waley translations. The overwhelming theme is resignation and age, but the expression varies greatly, from meditation to exhortation and even cheerfulness. I think it one of Britten's best cycles. The folksong arrangements simply amaze. "I will give my love an apple," to take just one, puts the well-known riddle song over an arpeggiated accompaniment consisting mainly of tritones (the interval known as the "devil in music"; C to F#, for example), yet retains its strange serenity. If you know Grainger's, Holst's, or Vaughan Williams's folksong settings, Britten will surprise you. He's not all that interested in evoking a pastoral past but in making dramatic, brilliant new music, and the means can be simple or complex. The "Second Lute Song" is an arrangement from the opera Gloriana, written for the coronation of Queen Elizabeth II. The opera, in addition to its claim as one of the great political operas, also represents Britten's take on Tudor music. Unlike Vaughan Williams, inspired by the choral music, Britten fastened on the lute song, particularly John Dowland's, and the court dances, with orchestral sounds translating what was then Historically Informed Performance, rather than into the late Romantic or Impressionist orchestra. The song here very much resembles one of Dowland's, full of psychological depth and twists of thought. It requires a great singer and a great guitarist. William Walton's Anon. in Love celebrates mainly physical love. The music, both suave and witty, ain't easy to carry off, but Walton wants precisely the effect of ease. There are runs of notes fiendishly fast and rather tenuous harmonic progressions, which, to be honest, Pears doesn't always get. However, he triumphs over the difficulties. This remains the best performance I've heard of the work. Others are either too stiff or more mannered. Pears enjoys the ride, despite the bumps. Seiber is not a name many know. Born in Budapest, he studied with Kodály. He became interested in jazz and turned himself into an expert. When the Nazis assumed power, he migrated to England. His music, clean and lean, emphasizes craft and clarity. I have heard nothing by him that's disappointed me. The French songs are the most conventional works on this program, and they should charm you out of your socks. 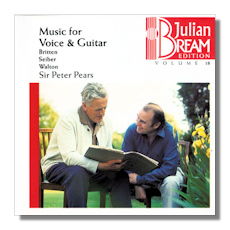 Pears and Bream collaborate especially closely here, achieving an intense unanimity of musical thought. Peter Racine Fricker, unusually for a British composer, studied with Hindemith, and this Shakespeare setting, full of quartal harmonies and melodic lines, shows the teacher's influence. Hindemith, despite his deep understanding of almost every instrument, never managed a piece for solo guitar. The closest he came was a Rondo for 3 Guitars, a beautiful work, but I've always suspected him of cheating. Fricker comes up with a noble miniature and gets the guitar to accommodate the complex harmonies, besides. If I have one complaint, it's that the accompaniment lies almost exclusively in the lower register. Pears and Bream achieve an almost ecstatic, waking dream. The big work on the program (in several senses), the Nocturnal after John Dowland, counts as Britten's only solo guitar piece. Written for Bream, it comprises 18 minutes of non-stop guitar. The night world inspired Britten again and again: Serenade, Nocturne, Midsummer Night's Dream, just some of the yield. As the title says, Britten based the work on a lute song by Dowland, "Come, heavy sleep." Most of Dowland's music reflects a depressed, or at least troubled soul. The Nocturnal captures this. This is no Chopinesque reverie, but a place filled giant, dark, predatory wings. Britten also evokes the Elizabethan fantasia, another Dowland genre, coming up with something very much in the spirit of Dowland's Lachrimae or Seaven Teares. However, Britten's fantasia doesn't meander capriciously, nor does he produce a set of variations on a tune. Instead, he breaks up the song into a small set of ideas on which he riffs. One idea, a scalar descent of a fourth (the alto part from Dowland's opening measure), becomes increasingly prominent, to the point of obsession. The music tosses and turns throughout the night, finally arriving at Britten's radiant quotation of the original song. Bream does a magnificent job, not just keeping it all together, but probing the score's emotional strata. One of the great chamber recordings of the stereo era has returned to the catalogue, for me superb original engineering much improved in sound – clearer, more intimate. Or it would be improved if not for unfortunate tape "bleedthrough," resulting in a very faint echo delay in the silence at the end of numbers, audible through earphones. I find myself able to live with it, even to ignore it. I say, be nice to yourself and get this one.